Join us for an unforgettable sunrise at Uluru. Leaving early from Ayers Rock resort we will spend the morning hiking around the base of Uluru absorbing the serenity of Central Australia's landscapes as the early morning sunrise engulfs the surrounded landscape around this ancient rock formation. An incredible way to spend the morning. An early start to the day! Travel into the world heritage listed Uluru–Kata Tjuta National Park to witness the spectacular sunrise over Uluru. After sunrise you will visit Uluru itself. We strongly recommend a walk around the base (approximately 10km). This world famous icon has a lot to offer and is best experienced by visiting the different significant sites along the track. Your guide will also take you for an informative guided walk around a section of the base walk. You will also visit the Culture Centre, where you can read all about and absorb the fascinating and ancient culture of the Anungu people. 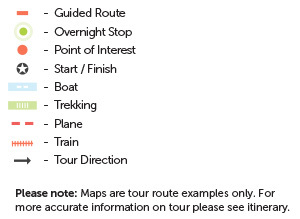 Tour starts an hour before sunrise and finishes just before lunch. You will be dropped back at your accommodation.